An overnight drive from Delhi to Manali is recommended. check in at your hotel and day for leisure for your own activities or relax. Manali is situated nearly 40 Kms from Kullu, which is the nearest airport to approach this beautiful hill station. Beas river flows through the town, known for breath taking landscapes, Deodar, Pine trees & snow caped peaks. Manali is an excellent place for holidays, a favorite base for trekkers to Lahaul Spiti, Kinnaur & Leh. Today full day excursion visiting Rohtang Pass (Upto Snow Line in case Rohtang is closed due to snow fall). Overnight at hotel. Rahatang Pass is about 51 Kms from Manali at the altitude of 4,111 meters on the highway to Keylong. There is a lake called Doshohar at the left of the pass. Rohtang pass is a crucial link on the old trade-route and still the gateway to trans Himalayan lahaul as Zozilla pass is between Kashmir valley & Ladakh. Morning after breakfast proceed to full day city tour of Manali and then drive to Kullu. Hadimba Temple also known as the Doongri Temple, this four-tiered pagoda-like wooden temple have beautiful carvings on its ornamental door. Hadimba temple is dedicated to Hadimba, the wife of Bhim. Vashist Spring - Across the Beas river, about 3 km away from Manali at an altitude of 1,982 meters (6,200 feet), are the natural sulphur springs. The village itself is perched on a steep hillside across the river Beas. Other places of interest are Tibetan Monastry, The Gompa is covered with brightly coloured frescoes and a mid size Buddhist statute. It also carries a list of the martyrs killed in occupation of Tibet of 1987 to 1989. Beas Kund, the great Rishi Vyas performed Tapa here during Mahabharta times. In time drive to Kullu, Kullu is famous for Dusshera is a unique fair held every year in October. 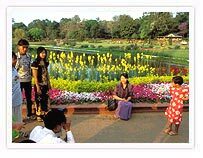 It is a beautiful amalgam of history, rich culture and customs. Kullu is is renowned for it's traditional handicrafts, Kullu shawls and caps are admired for their rich colored patterns. 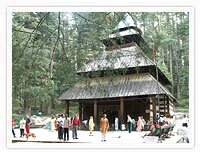 The places of Interest are Bijli Mahadev temple 10kms. from Kulu across the Beas river, Bijli Mahadev temple , from the temple a panoramic view of Kulu & Paravati valleys can be seen Raghunath Ji Temple 1 km. from Dhalpur, Raghunathji is the principal deity of the valley & Vaishno Devi Temple at a distance of 4kms. from Dhalpur. Day Free to Liesure and independent activities, Over night at hotel. There are many places where you can shop for handicrafts and local curios in Manali. Make a trip to the colourful Tibetan Bazaar at the extreme south end of Manali sells Kullu shawls, caps, and other woollen clothes, check out the Tibetan Carpets Centre at the Gadan Thekchokling Gompa for rugs, carpets and handicrafts. In time Drive to Delhi either fly or overnight bus to Delhi.